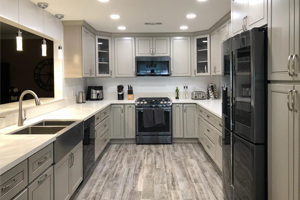 The cabinets available from Kitchens Pal in the heart of Los Angeles are some of the most affordable for the amount of luxury they provide you. Cabinets, whether in your kitchen, bathroom or any other room in your home, should be held to your standard of luxury, and Kitchens Pal is the perfect cabinet factory outlet from which to purchase your cabinets to achieve these goals. Additionally, your kitchen should appeal to your tastes; after all, itâ€™s your kitchen! You should design it the way you want, no questions asked. With that being said, here are some of 2017â€™s top kitchen design trends you may want to put into action in your own kitchen. Have you always wanted a different color of cabinetry thatâ€™s not considered normal? Now you can, and you can get away with it! Feel good each time you walk into your kitchen. When you love your kitchen, you wonâ€™t need a freshly brewed pot of coffee because your kitchen, itself, will refresh you. If youâ€™d like to transform your kitchen from old, shabby cabinets to an updated gray version, check out our Shaker Gray or Raised Gray Panel cabinets. When purchased from our cabinet factory outlet store in Los Angeles, youâ€™ll be saving money for your new luxury. When you are considering remodeling your entire kitchen and your kitchen cabinets need to be replaced, think about choosing cabinets that provide you with updated functionality. Choose to purchase a set of cabinets with glass doors and more. You may even choose to have a wall dish rack-styled cabinet installed to keep all of your assorted colors of Fiesta Ware as viewable as possible. Keep your home looking more classic than ever with a white cabinet accessorized with black drawer and door handles. The little pop of color provided by the handles will give your kitchen the dimension it needs to make it feel like your own little luxury. 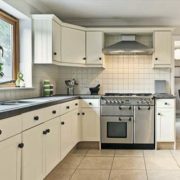 OurClassic White Shaker and Antique White cabinets are two of Kitchens Palâ€™s most popular; however, you may want to take at a more modern-style white cabinet, the Hampton Shaker. All of these white cabinets have customizable accessory features so you can achieve the classic white and black palette kitchen you want. Sinks donâ€™t have to be white, silver or black. Did you know you can order a porcelain sink in a freshly colored hue? 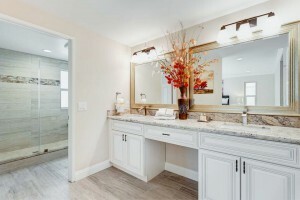 Step away from the traditional-colored sinks and consider an eye-catching colored sink, such as a light blue, green or any other color youâ€™d love to use to bring some brightness and fun into your little slice of heaven. The small amount of color your new sink can bring can make it the focal point of your kitchen and even tie the atmosphere all together. If you really want to upgrade your kitchen, itâ€™s time to put your project in full swing and think about not only cabinet options, but fixture options as well. Have you thought about updating your current, out-of-date lighting fixtures? Oversized light fixtures are a wonderful way to give your kitchenâ€™s atmosphere a more cozy, yet modern feel. Bigger fixtures have a great sense of depth perception and bring drama to the scene where as smaller ones have the opposite effect. 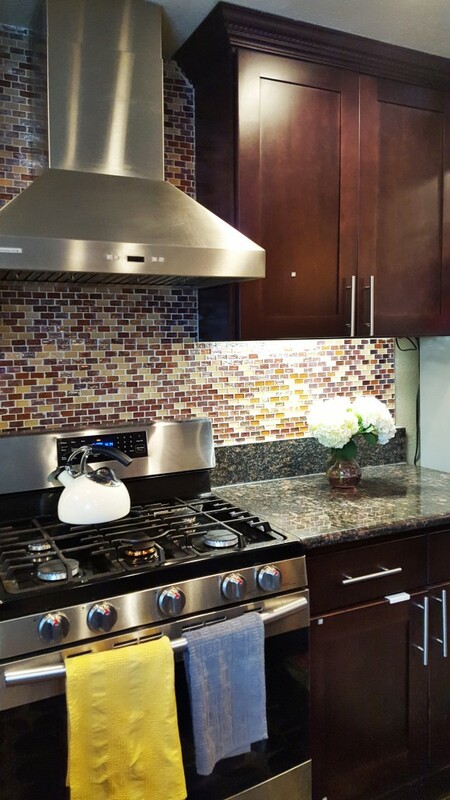 Have you ever walked into a kitchen which had dark cabinets with a light in color counter and backsplash? Did it impress you? It impresses us. This type of contrasting effect brings drama into a kitchen. Many homeowners think the installation of darker wood cabinets would create the look of a smaller kitchen, but on the contrary, many kitchen designers disagree because of the drama is created. As long as the kitchenâ€™s contrasting features, in this case, a white countertop and backsplash, the kitchen actually looks bigger. No matter how big or small your kitchen may be, there always seems to be too little space. 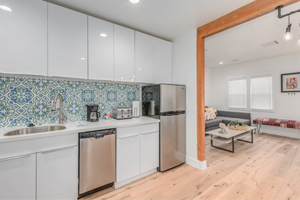 Too little of space can be frustrating which leads homeowners with the desire to update their kitchen to a space that provide not only an impressive first impression, but the storage and usability desired. At our cabinet factory outlet, you can purchase a cabinet set with incredibly roomy storage for pots, pans, plates, cups and so much more. You design it; weâ€™ll send it! Whatâ€™s better than kitchen automation? Not much! If you want a kitchen of the future, itâ€™s time to upgrade everything in it, such as replacing the older lights to sensor-activated ones, purchasing a meat thermometer that alert you via smartphone and installing hands-free faucet technology. All of these types of automation are perfect for every kitchen, especially one that is one of the future. Commercial Grade appliances are something you may want to consider if you want to have the most luxurious kitchen possible. An incredible kitchen design starts and ends with the appliances. 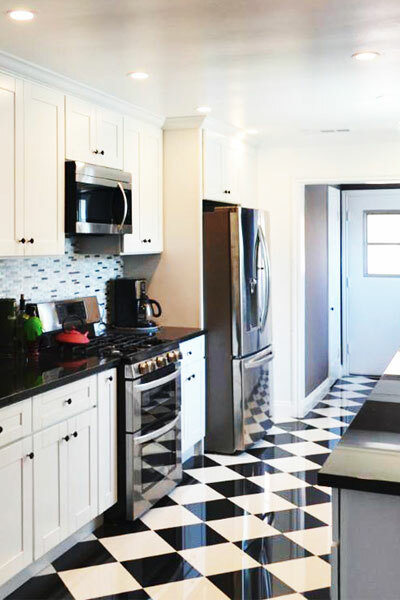 From functionality to the look it provides, commercial grade appliances, if in your budget, may be the best option for you if you want to upgrade your kitchen like no one elseâ€™s in the Los Angeles area. Who says you need to purchase the most expensive cabinets on the market to have the best looking kitchen? You donâ€™t! At our cabinet factory outlet store, you can purchase a product that is not only affordable, but one that will last throughout the lifetime of your kitchen. If youâ€™ve found some cabinets from our cabinet factory outlet and youâ€™re ready to upgrade your countertops but want to save a dime, think about purchasing look-alike countertops. Countertops which look like granite donâ€™t mean they have to be granite. Do some online searched and we bet you can find one for a fraction of the price, just like our incredible cabinets. If you want to change up your kitchen but donâ€™t feel like updating the cabinets, you may want to choose a new color for your quartz countertop. Recently, Caesarstone introduced a completely new line of durable quartz countertops. These countertop colors include the following: Linen, Espresso, Lagos Blue, Mocha, Ginger, Jet Black and Concrete. 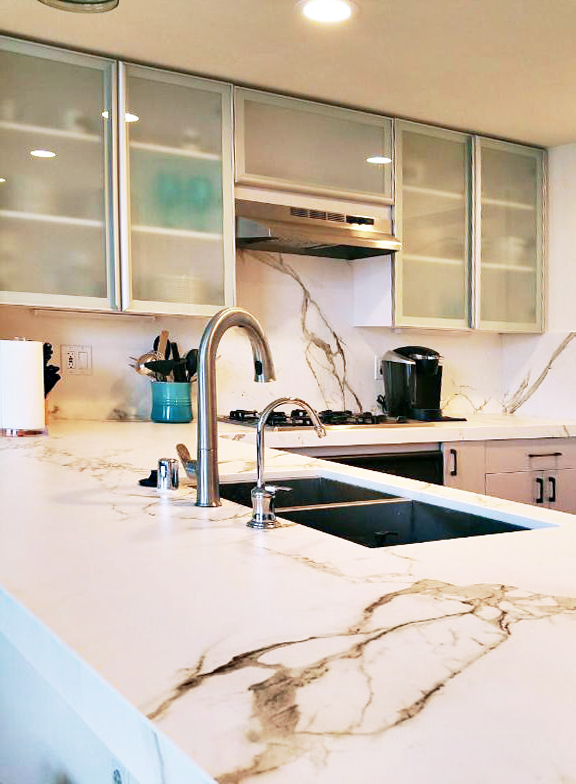 More affordable than marble, and easier to care for, these neutral colored quartz countertops may be the way to go if youâ€™ve recently updated your kitchen with new cabinets, appliances or flooring. Want to get more creative with your kitchen? Start by mixing countertop materials. No longer are quartz, granite and laminate your only options. Wood countertops are making their way into kitchen world with a bold attitude! Mixed countertops are not only fashion-forward, but theyâ€™re perfect when you want to inspire yourself and others who step foot in your kitchen. When wanting to upgrade the look of your kitchen, you may want to weigh your options, including a timeless farmhouse apron-front sink. You can choose between a cast-iron sink and porcelain sink which comes in a variety of colors, including neutral tones and dark hues that pairs well with granite countertops. 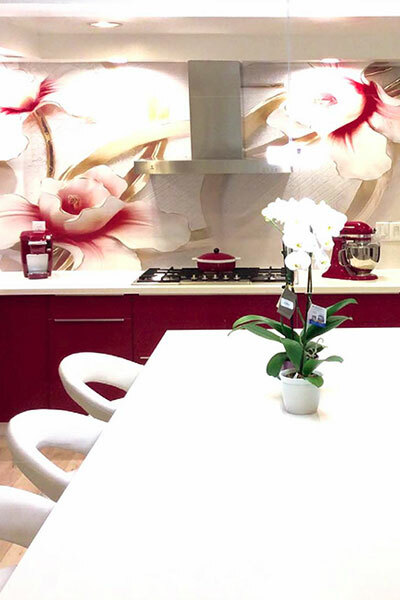 They provide a wonderful Â interior design to a kitchen and provides a focal point that wonâ€™t go unnoticed. Style is everything in a kitchen, and if you have one you want to flaunt, we encourage you to show it off. From amazing French Normandy-style designs to modern and seamless kitchens, thereâ€™s a style out there for every kitchen and every homeowner. But your first step may be to check out the different options youâ€™ll be working with at our cabinet factory outlet here in Los Angeles. A kitchen thatâ€™s a contemporary combo means youâ€™ll replace both the cabinets and the appliances to be as contemporary as possible. This means youâ€™ll want to purchase a cabinet set from our factory outlet store, such as the European-Style cabinets. Not only are these cabinet affordable, but theyâ€™ll be a great addition to your contemporary kitchen atmosphere. As far as appliances go, we highly recommend purchasing new stainless steel appliances. Are you always updating your kitchen to reflect your personal style? If so, youâ€™ll probably want to keep your kitchen cabinets modern, yet chic. A great cabinet to consider is the Cinnamon Shaker. These cabinets are rich in color but are versatile enough to look great with nearly any style appliance and countertop. Thereâ€™s nothing more modern than architectural lines. If youâ€™re searching for a way to bring out the detail of your kitchen, itâ€™s time to think about opting for architectural lines, such as the ones youâ€™ll get with the Kohlerâ€™s Purist faucet. Not only does this faucet provide a minimalist profile, but it acts as a 360-degree swivel spout. Designing the perfect kitchen for your home should be fun, easy and rewarding. 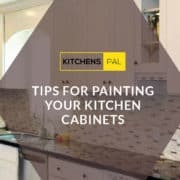 Join Kitchens Pal online today to check out the wonderful cabinets available, and contact us with any questions or concerns. Auburn Red Cabinets Perfect For a Garage Why Choose White Cabinets?